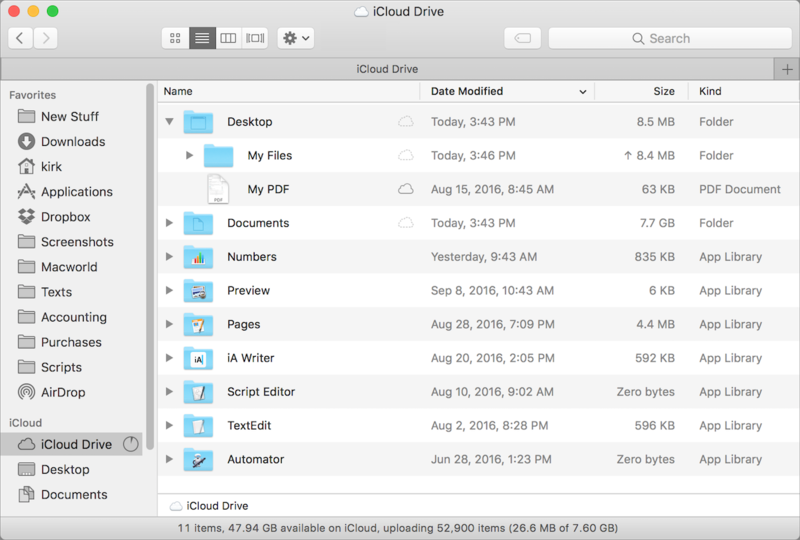 iCloud Drive has evolved a great deal since it was first introduced as part of OS X Yosemite and iOS 8. 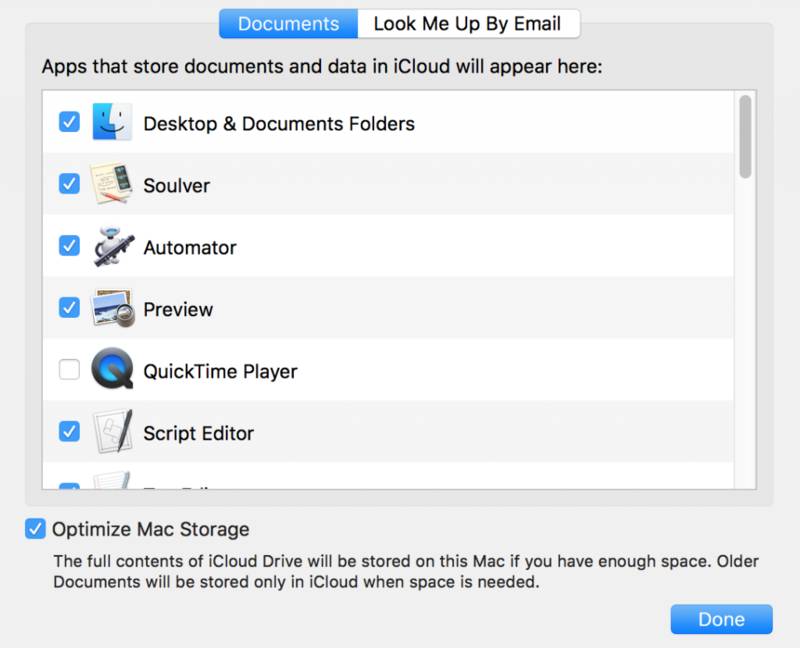 You may recall a story last year in which I discussed getting started with iCloud Drive and how to sync data between a Mac and an iOS device. 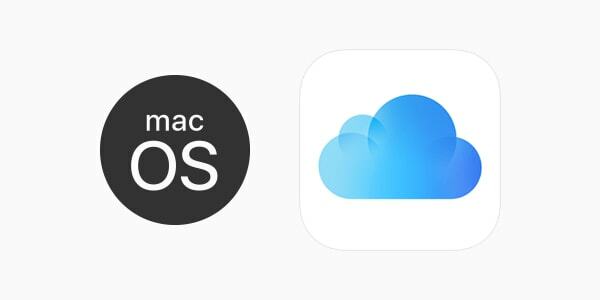 Those basic features have not changed, but macOS Sierra and iOS 10 have introduced a new iCloud feature. You can now have your Mac automatically store the contents of your Desktop and Documents folders in the cloud. This means that you can access these files on any other Mac, or on any iOS device, if you are signed in to the same iCloud account. In this article, you will learn how to work with macOS Sierra's new iCloud Drive feature and keep your files in sync on multiple devices. So let's get started! To start with, you need to tell your Mac to save your files on iCloud Drive. To do this, open System Preferences, then click iCloud. Click the "Options" button next to iCloud Drive. In the Documents tab, you will see a number of apps on your Mac that can store files on iCloud Drive. By default, the Desktop & Documents Folders item is unchecked; check this to tell your Mac to copy the contents of these two folders to iCloud Drive. When using iCloud Drive, it's important to ensure you have enough space in your iCloud account. The 5 GB that Apple gives you for free is likely not enough, so you will need to increase the amount of storage you pay for. There are three options: 50 GB for $0.99 a month, 200 GB for $2.99 a month, and 2 TB for $9.99 a month. When you are sure you have enough space in the cloud, you can check the Desktop & Documents Folders option and your Mac will read all of your files, then start uploading them. If you have a lot of files in these two folders, and limited bandwidth, it may take a while, even several days, for all these files to be uploaded. In addition, if your upstream bandwidth is low, it may take a long time to sync any large files. In this case, you may find this process to be unwieldy. The contents of these two folders now display in an iCloud section of the Finder sidebar. As you can see in the screenshot below, my Desktop and Documents folders show little cloud icons to the right of their names. The gray, dotted-line icons show items that have not yet been uploaded; the dark icon next to My PDF, shows that it has been uploaded. In addition, if you look to the right of the My Files folder, next to its size, you see an arrow pointing upwards. This indicates that the contents of that folder are currently being synced. One useful option is the Optimize Mac Storage setting, which you see at the bottom of the window of the first screenshot above. This tells your Mac to only save the contents of your iCloud Drive if your Mac has enough free space. If not, the files stay in the cloud until you need them. This is a great way to expand the storage of your Mac, especially if it has an SSD, with limited space. Of course, you can then only use these files when you have internet access. To access these files on another Mac, activate the setting you enabled on the first Mac. The second Mac will check with iCloud and display these two folders and their contents. As you create or modify files that are in one of these folders, they will be synced to the cloud. Even if the other Mac is not running Sierra, you can still access these files. Just click on iCloud Drive in the Finder sidebar; if you don't see it there, choose Finder > Preferences, click Sidebar, and check "iCloud Drive." Files in these two folders won't be synced automatically, so you will need to drag them to those folders in the iCloud Drive for them to be accessible on your first Mac. Though to make this easy to deal with, and prevent errors, it's best to update both of your Macs to Sierra. You can also access these files on your iPhone or iPad. To do this, go to Settings > iCloud Drive and toggle this feature on, if this is not already the case. 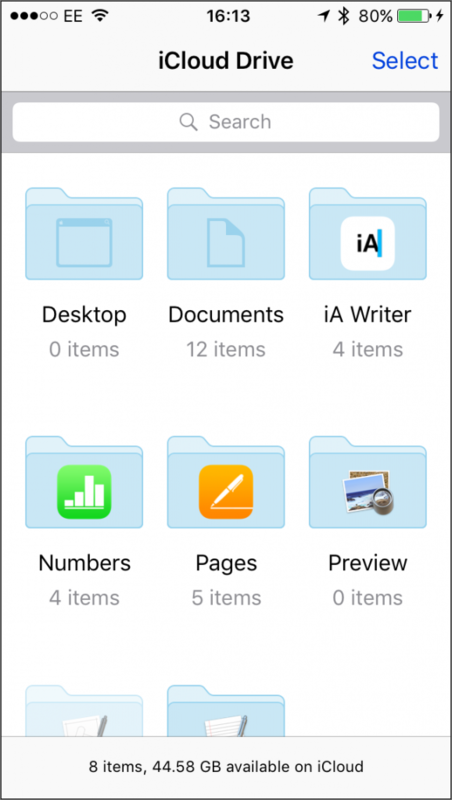 Next, locate the iCloud Drive app, tap it, you'll see your Desktop and Documents folders, along with any other folders stored on your iCloud drive. Many of the files in your Documents folder aren't very useful to you on an iOS device. You won't be able to open them all on iOS; this depends on which app created them. But these files don't take up any space on your device, unless you open them from iCloud Drive. However, if your iCloud account doesn't have a lot of free space, you may find it useful to move some of the files from the Documents folder to another location on your Mac. You can only really do this if you have an external hard drive, but if you do keep a lot of files in your Documents folder, you may need to do this to be able to store that folder in the cloud. Unfortunately, there is no way to tell your Mac to not upload certain folders within your Documents folder. If you ever decide that you no longer want to store these files in your iCloud Drive, just go back to the iCloud preferences and uncheck Desktop & Documents Folders. The dialogue will ask you to confirm that you no longer want to sync these files, and will inform you that they will remain in your iCloud Drive. Click Turn Off, and your Mac will stop syncing. Don't delete them from iCloud Drive; if you do this, they'll go into your Mac's trash. You need to copy them back to your home folder, the one with your user name and the house icon. So check out the new feature in iCloud Drive. If you have more than one Mac, or want to access your Mac's files on an iOS device, you may find this to be very practical. Editor's note: Originally published September 22, 2016, this post was updated January 3, 2018 for accuracy and comprehensiveness. New to Mac? We're here to help! This entry was posted in Apple, How To, Recommended and tagged iCloud Drive, macOS Sierra. Bookmark the permalink. all makes sense … BUT … I have switched off synching and I seem to have some kind of ghost upload going on that is blocking the synch for other docs – so is there a plist file or something similar that I can access and delete – to force iCloud into thinking that it is just has to start again. turns out that plist is not something used in doc synching … eventually fixed by synching issues by logging out every where THEN rebooting machines – and then logging back in – now it is working like a charm. Some things are mentioned above but should be underlined and exxplained: for example, if you’ve got Documents&Desktop sync turned on and you later turn it off, ALL THOSE FILES ON YOUR MAC WILL BE DELETED. Right now this is confusing or upsetting to a lot of people who don’t clearly understand that they will need to download all their Documents and Desktop folder files from iCloud Drive (where they still reside). Apple should have done a better job explaining what the feature is and how it works. Until now, I am using Dropbox to sync between macs. Can I use iCloud instead, you think? So when I go to save something like from Acrobat or Publisher the sidebar no longer shows documents, and I can’t navigate to it through the save menu. It only shows my attached devices (like the printer and my external hard drives). It no longer shows documents or desktop or dropbox or any of my favourite locations. How do I fix this? Thank you Kirk. Do I understand it correctly that I cannot delete my documents from iCloud once they’ve been stored there? flavio. Is there any way to pause to upload from my iMac? It is about 28GB to upload and uses all of my bandwidth. Thanks. In a Finder window, press SHIFT+CMD+H. You’ll see the folders for Desktop, Documents, and others. Create a folder there (maybe call it “Files”). iCloud won’t sync anything in that folder. I was searching for a way to store documents/files on my MacBook and not in the cloud. It appears I can store them on Mac and in iCloud but I cannot stop syncing to iCloud and just store on my Mac. I hope I’m mistaken. Is there a way to store files and documents just on the Mac with Sierra and not in iCloud? Most of the documents in your Documents folder are data files for various apps. You didn’t didn’t even know that the software created them, you don’t need to sync them, and they are HUGE. My Documents folder even contains virtual machines! Finding your actual documents among all that cruft can be hard. No matter what cloud service you use, if you sync Documents, you will probably end up paying a monthly fee. I created a folder in my home directory as a peer to Documents. I called it “~/Files” then I set apps to use that folder as the file location by default. My files are very easy to find. I used a symlink to sync that folder through Dropbox. I’ve never paid a monthly fee. hack encrypted iCloud files at will. Final question: for highly sensitive documents, I turn off my wifi, create or use the document and then save it to an external drive and disconnect that external drive before turning on my wifi. Is that a safe method to protect selected data? I have 2 files that are hung up. I was uploading about 400 files in a folder. 2 of the files seem to be hung … I have tried shutting down starting up exiting resetting etc etc. Still, after 24 hrs, the menu rectangle says 70KB of 11.7MB uploading, What can I do to cancel this process? anyway-why do I have 2 iCloud’s on the sidebar?shouldn’t be one?and if so,who made the second one? thanks for this! I have more questions re. icons that appear next to file names: what does the cloud with an arrow pointing down mean? I just switched this off. I copied the files from iCloud back to my local desktop and documents. These folders are now empty in iCloud. However whenever I try to delete the (empty) desktop and documents folders in iCloud, they just come back again with seconds – very annoying.